Home » which is better » EarPopper versus Otovent... Which is Better? EarPopper versus Otovent... Which is Better? Before describing which device is better to treat a clogged, muffled ear whether it contains fluid or not, first a short description of the problem itself known as eustachian tube dysfunction. Although (most) adults can easily pop the ears to alleviate the ear pressure with a swallow, yawn, or blowing against a pinched nose, it is not unusual for most young children to not know how to do this. Some may not even know how to blow the nose. Even some adults may struggle after an upper respiratory infection and find it very hard to pop the ears. As such, these devices help an adult to pop a stubbornly clogged ear or allows a parent to help a clueless child pop the ears. The Otovent uses a simple balloon whereas the EarPopper (and its cheaper knockoff competitor Eustachi) utilizes an electric motor. Watch the videos below to see how each work before reading about which is "better". Whereas the Otovent essentially mimics only the valsalva maneuver (trying to blow air out the nose while pinched shut), the Earpopper simultaneously mimics the valsalva AND physically increases the eustachian tube diameter with swallow (muscles pull the eustachian tube open). 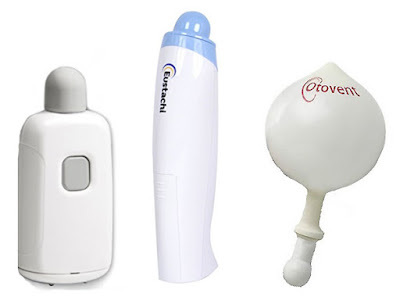 EarPopper works better due to the dual action of swallow and valsalva... but given how much cheaper the Otovent is and how it can be turned into a funny game, Otovent may appeal more to grade school children. The Eustachi works exactly the same way as the EarPopper but is over 60% cheaper. However, due to a cheaper build and fact that it has not undergone rigorous testing that EarPopper has, it is considered a knockoff that has appeal based on price alone. This is not a paid advertisement. My opinions are my own.